Leslie Shoecraft, NMT-BC, Rhythm-N-You, works with the residents of Holzer Senior Care Center. 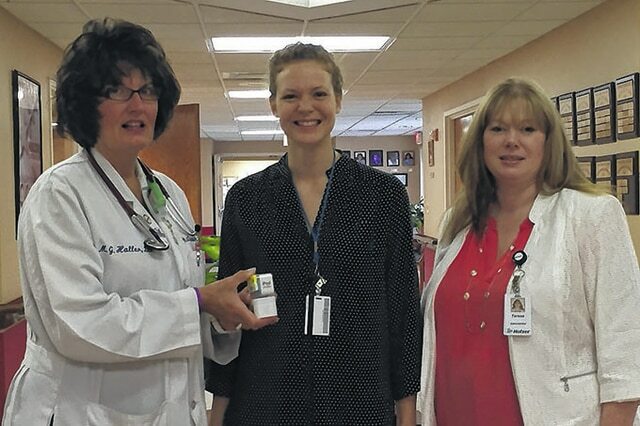 Dr. Marla Haller, post-acute care services, Holzer Health System, donates three iPod Shuffles to Holzer Senior Care Center, with Leslie Shoecraft, Rhythm-N-You, and Teresa Coffee, administrator of Holzer Senior Care Center. GALLIPOLIS — Holzer Senior Care Center has begun offering music therapy as part of its services to residents. Leslie Shoecraft, a board-certified neurological music therapist, of Rhythm-N-You, spearheads the efforts for the program. “Music is an essential part of improving the quality of life,” Shoecraft said. While music has traditionally been thought of as soothing, relaxing and pleasant to listen to, Shoecraft said music therapy uses music to help with rehabilitation in several ways. It can provide help with pain relief and make necessary physical therapy a pleasant experience and not a chore. Music therapy can improve speech in patients through the use of rhythm and pitch exercises during singing. Recent neurological research suggests that singing uses parts of the brain other than the speech center, and music therapy can help retrain the brain’s pathways to improve speech, even if that part of the brain has been injured. To strengthen these efforts, Dr. Marla Haller, corporate medical director of post-acute care services for Holzer Health System, donated three iPod shuffles for residents to enjoy music at the facility. Dr. Haller donated these in memory of her grandmother, Alma Griffith, who would have been 104 years old this year. Dr. Haller said Griffith had Alzheimer’s, but always had a love of music. The residents of Holzer Senior Care Center, she said, will utilize the iPods for residents by programming them with the individual residents’ favorite music. Shoecraft said temporary improvement in memory and communication in dementias — including Alzheimer’s — can be seen by having the patient sing familiar songs and then try to recall experiences related to the song. Shoecraft will be offering music therapy at Holzer Senior Care Center on Monday mornings, working with 12-15 people during that time. Participation in the playing of musical instruments and composing songs, Shoecraft said, can result in better patient cooperation in necessary physical exercise sessions. Shoecraft said music therapy uses music to encourage specific needed exercises, more socialization and to improve activities of daily living.